Guest post by Hamish Lucas. Daylight savings is here again! What a wonderful time of year it is. Crisp cool evenings, warm afternoons and extra long days are conducive to getting more work at home done and more play time with our baby boy. It truly is one of my favourite time of year, which is why, when the clock ran forward an hour last Saturday, I was in an excellent frame of mind. That is until Monday morning. 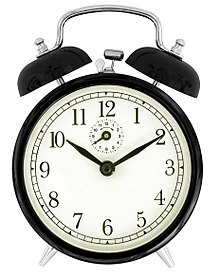 By Sunday evening i was still yet to put all our clocks forward to match the new EDT (GMT-9). My trusty iPhone with which I am addicted however did not let me down, and automatically updated the time on Saturday night. With this in mind, and faith in my heart, I went to sleep knowing I would be woken by my reliable, trusty iPhone. Monday morning 5:30am, all my clocks are reading 4:30 and the iPhone starts its alarm, claiming it’s 6:30! OK so I cope with that (mostly because I didn’t notice at the time) and get to work early albeit groggy. Some discussion has ensued as to why this may be. It’s a recurring alarm, set before the Daylight savings period. Clearly there’s a bug, because the alarm is stored in gmt, which didn’t change of course. Happy with this diagnosis, I deleted all my alarms and reset them. Tuesday morning: 5:30am – you guessed it, the alarm went off! In frustration, I set a single alarm for 8:30 so I could sleep in a bit. This logical course of action had the iPhone’s alarm going off at 8:30! So now very late to work, the diagnosis of this bug was really starting to annoy me. At this point I realise that my diagnosis was – ahem – wrong. If I was right, the alarm would be going off late not early. So it seems that Apple and Steve Jobs have overcompensated. Let’s leave the innuendo alone, I’m not quite furious enough yet to start overt personal attacks. Now comes some testing between myself and my tech savvy iPhone confederates. As it turns out, this bug, that may or may not have been triggered by the onset of daylight savings, only affects my most favourite of features: The repeating alarm. The alarm that I rely on. The alarm I never have to set. The alarm that knows not to wake me on weekends. This now buggy alarm has done what I thought nobody could do: Turned me from an impoverished iFanBoy to actually noticing all the other little bugs in the iPhone. Whilst I still think it’s a great piece of hardware, Apple’re going to have to fix this fast, and apologise greatly in order to restore my faith in their programming. By Wednesday morning, tired, disenchanted and miserable, I made it in to work on time. Thanks Apple. You’ve ruined my happy Spring. We’re aware of this issue and already developed a fix which will be available to customers in an upcoming software update. But there's no word yet on when the update will be coming out. Yes I heard about this error, it was on breakfast radio. Like any problem the 'fix' was to turn the phone off and reboot. As I don't have a phone, I'm not sure how accurate this was. I do know that my recurring 9am Outlook meeting is always bumped to 10am post daylight saving.